Tart House: Mr. and Mrs.
My friend Malia is addicted to buying dishes; mixing bowls, glasses, plates - you name it. 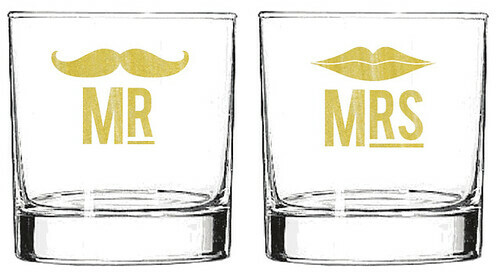 I've never really shared her enthusiasm until now - I'm obsessed with this Mr. and Mrs. glass set. Wouldn't they make a great wedding present? Those are amazing! I'll tell you what they would make a great present for, your friend Malia's birthday on December 29th.